Peel and cut oranges and grapefruit into 1/2-inch rounds, removing as much pith as possible. In a small bowl, whisk together olive oil, red wine vinegar and honey. Season with salt and pepper, to taste. 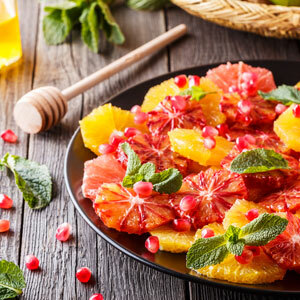 Layer sliced oranges and grapefruit on a large serving platter and drizzle with honey vinaigrette. Garnish with pomegranate seeds and serve. Makes 6 servings. Published on January 1, 2019 in Salads.